While I was in Manchester, I woke up to a snowstorm. So, I went out to get photos of it. I didn’t have a lot of time to do so as I was heading to Sheffield, so I had to make the most of it. It was the first time i’d been away somewhere when it was snowing since Amsterdam and Rotterdam in 2012. As my hotel was near to Old Trafford, it was only natural I would be getting some photos of the snow covered exterior. I’m not even joking, while I was out getting photos, there were men at work clearing it driving Official Manchester United Snowplows. Probably in association with Mr Plow. As I was walking past Old Trafford, the closest Metrolink stop was Old Trafford, so I got some photos en route. When I arrived in Manchester City Centre, it was slush, there was nothing worth photographing. I then headed to Sheffield by train with a window seat, and had some amazing views of the Peak District covered in snow. Unfortunately, I was unable to get any photos of that. On the Thursday, I walked past Ordsall Hall and got some photos of it as it still had snow around it. I headed to Manchester to see United take on Burnley and, as is now tradition when I visit Manchester, I travel accompanied with my camera in search of Street Art. One of the first places I head to is the Northern Quarter and Stevenson Square. This time, I knew I would be hitting the jackpot, as the weekend before, local journalist Sarah Walters posted on Twitter that there was new works in progress at Stevenson Square. One of the pieces by Nomad Clan in the Northern Quarter has some work being done on the building, so i’m not sure what the future of that piece is. There was a pub near Picadilly Train Station which has a “And on the sixth day …..” mural om a wall at the side, but the area was blocked off making it hard to get a decent photo. When I was last in Manchester in November, there was a work in progress of a mural of The 1975. Turns out it was an advertising mural for their new album, which is a bit rubbish. It has now been replaced by another advertising mural, this time for a bank. I didn’t even bother to get a photo of it. Most of the photos were take on the Tuesday, but I headed out on the Thursday to do a mop-up and get some better photos of the ones I had already taken due to having daylight to work with. While I was in the city, I picked up a local guide/magazine (which is free) called Manchester’s Finest, and when I read through it, there was an article about Street Art in the city, so keep an eye out for that if you are visiting. November 2018 began for me with a trip to Windsor Park to see Linfield scrape a late draw at home to Warrenpoint Town. From Warrenpoint to Waterford, as the following week I spent a few days in Waterford seeing Waterford Walls, with a brief stop-off in Dublin. The day after my return to Belfast, it was back to Windsor Park to see Linfield lose to Coleraine. The following weekend, a new ground for me to visit for the first time, as I headed to The Brandywell to see Linfield take on Institute. The day after, it was a return to Windsor Park, and another bad home result, as Northern Ireland lost to Austria in the UEFA Nations League. On the following weekend, I headed to The Limelight to see Cast in concert. That was then followed by a good home result at Windsor Park, as Linfield beat Cliftonville 4-2. I then headed to Manchester for a few days, to see United take on BSC Young Boys and get some Street Art photos. May 2018 began for me by chasing Street Art, getting photos of Murals at Bankmore Square and Bank Square. 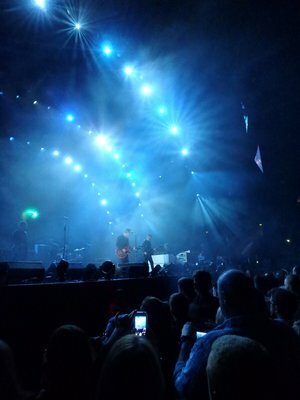 That was then followed by a trip to The Odyssey to see Noel Gallagher’s High Flying Birds. The following weekend, I headed to Manchester to see United take on Watford, as well as getting some Street Art photos, both in the City Centre (mostly, Northern Quarter) and then Pomona Wharf. On the Bank Holiday Weekend at the end of the month, I headed to Titanic Slipways for BBC’s Biggest Weekend where I saw Manic Street Preachers, Beck, Ash and Franz Ferdinand. The end of the month was dominated by Street Art, going to check out Street Art on Bruce Street, and attending Wardrobe Jam. Yes, I know it’s actually Pomona Wharf. Visible on the Metrolink as you travel to and from Media City, i’ve been documenting this area on foot for a few years now. In the six months between visits, there has been a lot of new work, which made this a productive visit. In a change from my usual routine, I walked the route from Salford Quays to Cornbrook rather than the other way around. The weather when I went out on Wednesday morning was very dull, so apologies for the picture quality. One complaint, it’s a lovely walk and i’m sure it’s a nice cycle. If I lived near there, i’d be utilising this. However, it is very unkempt and dirty looking, and could look a whole nice with a minimum of effort. The Street Art on the wall does brighten it up though. I was in Manchester recently, primarily for football, but it would have been rude not to get some Street art photos. A veteran of Manchester, I knew where to go in terms of finding Street Art. As soon as I arrived in the City Centre, it was straight to the Northern Quarter, most notably Tibb Street and Stevenson Square. On Tibb Street, there was a mural of Tony Wilson, which I hadn’t got photos of, so I was glad to see it in person. It wasn’t the first Tony Wilson related Street Art I have photographed, after capturing a tribute to him which appeared in Belfast after he died in 2007. The weather when I arrived on Tuesday was wet and dull, so apologies for the picture quality. It was so wet, I headed to my hotel near Old Trafford and wrote off the rest of Tuesday. I then used the Wednesday morning to get some more Street Art photos in the City Centre. Again, the weather was dull, but it wasn’t wet. I spotted a new piece near Picadilly Station called The Doodle On Ducie Street, on Ducie Street, a collaborative project with Manchester’s homeless community. That was spotted as I headed towards Ancoats. While heading from Ancoats to Arndale, I spotted a work in progress on Salmon Street of The 1975. I’ll be back at the end of January for the Burnley match, so i’ll be making sure I get a photo of it. I’m heading over from Tuesday to Thursday. If the match is a Tuesday, i’ll have Wednesday free, so I might take a day trip somewhere. If I do go somewhere, i’ll have my camera with me in case I see Street Art. 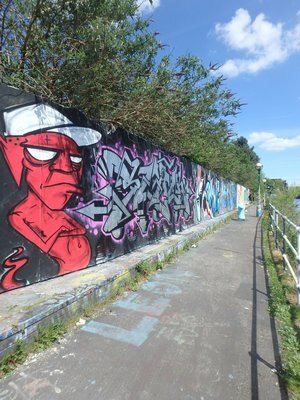 As pointed out in the last update, it should probably be called Pomona Wharf Street Art, but it leads to Salford Quays. so i’m sticking with this title. Whenever I travelled by Tram between Old Trafford and Manchester City Centre, I always noticed this from outside the window, a constant row of walls of Street Art. Eventually, I decided to investigate this for myself, getting off at Cornbrook Metrolink Station, and found it on foot, getting as many photos as I could. Every time I have travelled over to Manchester since, I have always made sure I visit here to get photos. Over to see United play Watford recently, I spent the morning of the match in Manchester City Centre, so that I could make a short tram ride to Cornbrook to then walk to Salford Quays, and then on to Old Trafford. The weather was nice, which meant I had a lot of daylight to work with. Another stroke of luck was that I took a wrong turn, and stumbled upon a new piece with a swarm of worker bees with the caption “WE (HEART) MCR”. I walked along Pomona Wharf and got photos of the new pieces I hadn’t seen before, as the walls had a mixture of old and new pieces. I was in Manchester at the weekend, so I decided to go out and get some Street Art photos. I didn’t have much time to work with, so I had to make the most of what I had. The plan was to go to Northern Quarter and Ancoats where I normally go. My last visit to Manchester was in December 2017, five months ago. To my surprise, there was still a lot of work that was still there from my last visit. That included Stevenson Square, which usually has a high turnover of Street Art. I managed to stumble on a piece in defiance against the bomb attack in the city in May 2017 in Dale Street which I had previously missed, as well as spotting an owl in Ancoats. When you go in search of Street Art, you have to keep an eye out for things. Here we are, the final photo round-up of 2017, looking back at my adventures in December. Well, December so far. December began with a trip to Windsor Park to see Linfield take on Dungannon Swifts. That was followed by a trip to Ulster Hall to see The Divine Comedy in concert. I was hoping to follow that with a trip to Carrick to see Linfield play Carrick Rangers, but that was postponed due to snow. I decided to make the most of a football free Saturday, by going out and getting pictures of the snow in Belfast. There was one final concert for 2017, as I headed to The Limelight to see The Charlatans. 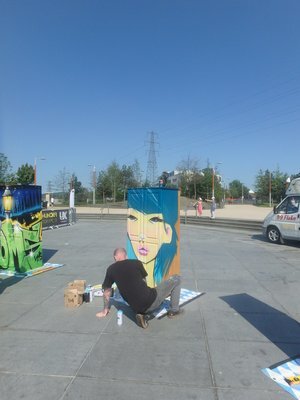 The following day, I flew to Manchester, to see United take on Bournemouth primarily, but I also managed to squeeze in some Street Art photos from Manchester and Salford Quays. Upon my return, I headed to Windsor Park to see Linfield play Warrenpoint Town and draw 3-3. The following Saturday, it was another visit to Windsor Park to see Linfield beat Cliftonville 2-0. There’s still eight days left in December, i’ll be at The Oval on Boxing Day, and then back to Windsor Park next Saturday for more photo adventures. I hope you’ve enjoyed this series looking back at 2017 In Pictures. I’m already looking forward to see what 2018 will bring in terms of photo adventures. After all these years, I think I might have been getting the name of this blog series wrong all this time. I checked the signage, and it appears this area is known as Pomona Wharf. Between you and me, i’ll still keep calling it Salford Quays. As you get the tram to Media City or Eccles from Picadilly, you can’t miss it when you look out the window. Having worked out that the stop to get off is at Cornbrook, I began to start doing this when I am in Manchester, getting off there and walking along getting as many photos as possible. I was in Manchester from Tuesday to Thursday, but I waited until Thursday to get photos. It was the afternoon, but it got dark really early there, though there was some sunlight that was there made some shots awkward. There were some old pieces, I left them, and new ones, which I unsurprisingly snapped. My favourite one was one of a Transformer. I don’t know what one it is, because it’s been a while since I last watched Transformers. My shadow appearing in the images was intentional, but that and the dark sky above makes the image almost apocalyptic. Until my next stroll along the canal, enjoy.